The initiative will be implemented through a new agreement between Oceania Rugby and UN Women Fiji MCO, starting with pilot testing of the new Get Into Rugby PLUS life-skills programme for girls and boys keen to play rugby. Regional research is also planned to better understand the interaction between violence against women and girls and sport in the Pacific Islands, and a focus on women’s equal participation in community rugby sevens events. The initiative is co-funded by Oceania Rugby, through Rugby Australia and the Australian Government’s Pacific Sports Partnership programme, and also by the €19.5 million Pacific Partnership to end violence against women and girls (Pacific Partnership), funded by the European Union (€12.7m), Australian Government (€6.2m) and UN Women (€0.6m). “This is an exciting initiative, for Oceania Rugby and rugby within the region. The Get Into Rugby PLUS programme will create highly skilled rugby coaches who can provide a safe, equal and inclusive environment for girls and boys in rugby,” said World Rugby’s Rugby Services Manager for Oceania Bruce Cook. “Selected coaches will be provided high quality training in both rugby related areas and life-skill themes, which will enable these coaches to teach both the game as well as life-skill activities to young players. 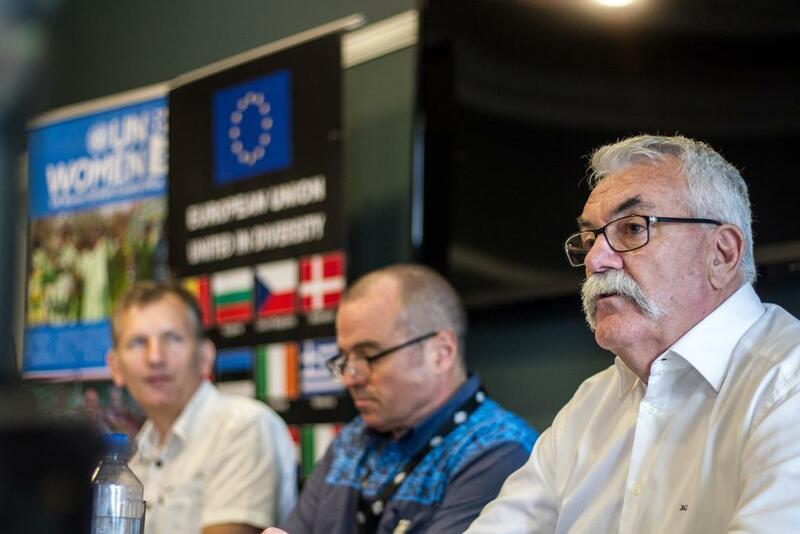 Christoph Wagner, Head of Cooperation at the EU Delegation for the Pacific, added: “There can be no sustainable development without gender equality. In the Pacific region a key barrier to equality is violence against women and girls. Pacific leaders have recognised this as a challenge which should be addressed in a comprehensive manner, including through sports associations. Leveraging sports-based approaches to promote gender equitable social norms at individual and community levels is one of several key focus areas for UN Women Fiji MCO, which is implementing one of the three outcomes areas of the regional Pacific Partnership. “Women in the Pacific region experience constant and continual inequalities such as the highest rates of violence in the world and limited participation in decision-making, including the lowest levels of women elected in parliament globally,” said Nicolas Burniat, Representative for UN Women Fiji MCO. “Sport can be an effective tool to address issues of gender inequality by challenging the preconceived ideas that people have about the respective roles and abilities of women and men, and to transform the patriarchal norms which are at the core of violence against women. The initiative will progress its Get Into Rugby PLUS pilot training for coaches this year. Get Into Rugby PLUS will provide activities to encourage equal and safe rugby participation for girls and boys, building on the Get Into Rugby (GIR) programme developed by World Rugby. Regional research planned for the initiative has several components planned to better understand the barriers for women and girls to access sport, the interaction between sports and violence against women and girls in the Pacific, and ways to develop effective social marketing messaging and strategies that use sport and sporting events to prevent violence against women and girls. These activities will be implemented by Oceania Rugby and UN Women Fiji MCO, through the Pacific Partnership that brings together governments, civil society organisations, communities and other partners to promote gender equality, prevent violence against women and girls (VAWG), and increase access to quality response services for survivors. The Pacific Partnership’s three outcome areas are jointly implemented by the Pacific Community (SPC) Regional Rights Resource Team (RRRT), Pacific Islands Forum Secretariat (Forum Secretariat) and UN Women Fiji Multi-Country Office (MCO).